Two patterns going on the blog today – same yarn, same basic construction but one is for regular mittens and one will help you make a set of flip top mittens. 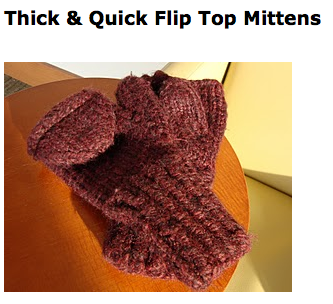 These mittens are made with Lion Brand Wool-Ease Thick & Quick. I have been wearing my set for the past month or so and they are wonderfully warm. Free patterns are released under a Creative Commons Attribution-Noncommercial-No Derivative Works 3.0 United States License.